Teaching your daughter affirmations can be an incredibly powerful tool for developing her self-confidence. Often, girls are complimented on their appearance and not on their abilities. Instead of telling a girl that you love her hair or dress, tell her that you love other things about her personality or abilities. Teach her to affirm herself and her confidence will take her far. 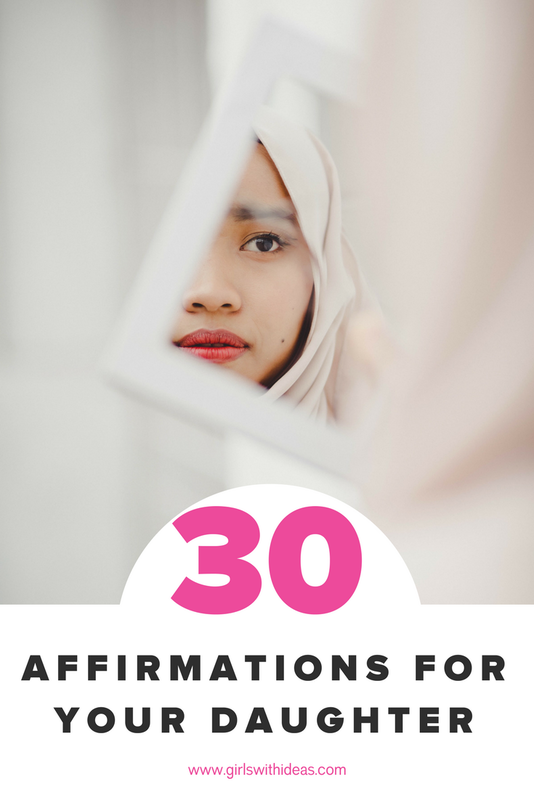 Here's a list of affirmations to teach your daughter. Have her repeat these in the mirror or when she wakes up in the morning for a little pep talk! "I can learn hard things." "I am a problem solver and I will find a way." "You have to be a beginner before you can be an expert." "I will only compare myself with the best version of myself." "I will show kindness, even when it seems hard." "I am allowed to feel my feelings." "I will be compassionate to myself and others." "I am a girl who has lots of ideas." "I will accept my flaws." "It's okay to be sad." "What I have to say matters." "I believe I can change the world." "It's okay to ask for help." "Baby steps will move me forward." "I will speak up, even if my voice shakes." "I can accomplish anything I set my mind to." "I accept what I cannot change." "I am kind, I am smart, I am important." "I am thankful for everything in my life."